The Cincinnati Bengals drafted C.J. Uzomah in the fifth round of the 2015 draft as a developmental prospect at tight end. Four seasons later, Uzomah has struggled to achieve the stats of a league-average player at the position. 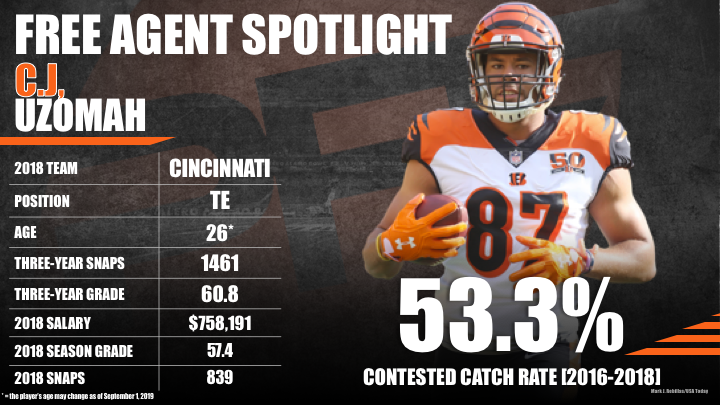 While he’s had to share snaps with Tyler Eifert and Tyler Kroft, both were injured early this year, and Uzomah failed to take advantage of the opportunity, producing a 57.4 grade that ranks 34th out of 41 qualifying tight ends. Uzomah finally got his chance to shine this season, but he failed to make the most out of his targets. The fifth-round pick out of Auburn earned just a 54.9 receiving grade and averaged only 1.00 yards per route run, which ranks 34th out of 40 qualifying tight ends. Uzomah has also struggled with drops throughout his young career, ranking inside the top-ten in drop rate each of the last three seasons. Uzomah has been decent as run blocker, earning a grade of 60.0 or higher in the last three years, but the former Auburn Tiger will likely be signed by a team looking to add depth behind their starter at the tight end position. Subscribe to Pro Football Focus’ ELITE subscription to research CJ Uzomah’s grades, advanced stats, snaps and more in Premium Stats 2.0.